Yahoo Screen - Helmet cameras show the battle between cyclist and motorists. We hit the road with cyclists wearing helmet cams to show the perils of the art, and reflect on the tragic consequences of one cyclist who ran a red light. . In the first part of the video, I'd say that if the cyclist had not been staring down at the road, he would've seen the car and not been involved in a collision. Recently, I've noticed a worrying trend - and it's clearly seen in the video. "Ninja cyclists". Black bike with no lights or reflectors, black clothing and black cycle helmet (if worn). I like to see a cyclist wearing hi-viz gear and a helmet, with their bike properly fitted with lights and reflectors. When I see such a cyclist I think, "There's one of the better ones". I think there needs to be a fundamental change in the law that makes h-viz gear and lights and reflectors compulsory. 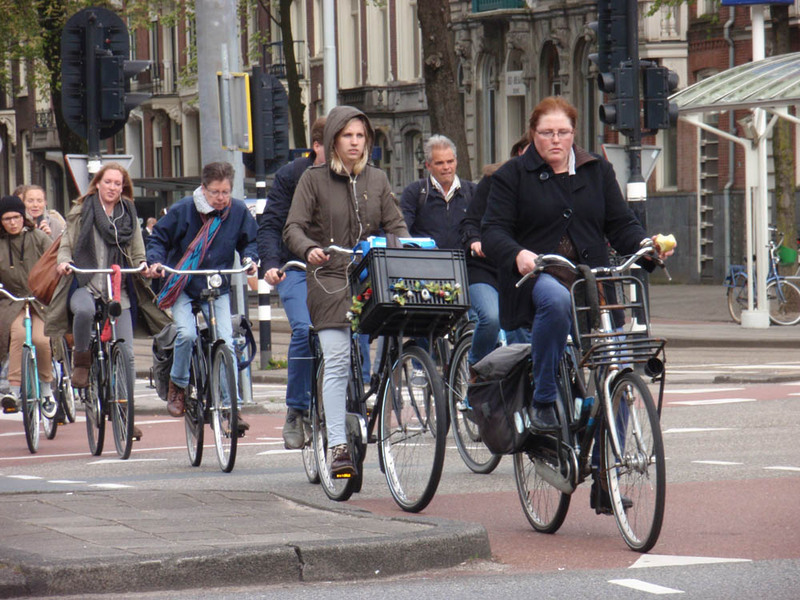 I would actually like to see cyclists act like they do in, for example, Amsterdam. They wear normal clothes, ride normal (upright) bicycles and pedal slowly and carefully. Most cyclists around here seem to be on "personal best" runs with no consideration for anyone else. malcolmw didn't write : but Weepej tried to change it to"Most cyclists, motorcyclists and drivers around here seem to be on "personal best" runs with no consideration for anyone else. Edited by Admin as quoted improperly. Note you must never change someone's words and then quote it, as if it is what they said. I profoundly disagree with your edit of my words. I do not experience drivers or motorcyclists "racing on the highway" in the normal course of my travel. The problem IMO is that many cyclists in the UK treat getting on a bike like sport and not transport. If cycling were viewed as just a means of making a journey rather than some sort of health pursuit then it would be better for all road users. Virtually all drivers are just "going somewhere" and are not trying to do this as fast as possible (or faster than they have achieved before). I am also concerned by the term "superhighway" being used to describe a cross-London cycle route. This has (unnecessary) connotations of speed. As I have said before, where I live almost all cyclists wear Lycra gear, use competition type bicycles and pedal furiously. This is not prejudice, just my observation. I agree, I wonder what Weepy would think if all motorists wore helmets, fire proof overalls, racing harnesses and had roll cages in their cars? I'd love to see more people out on cycles in normal clothes, no helmet, no hi viz, kids in tow. There's a big problem though, perceived danger. Here's a picture from Amsterdam, bring it on I say, but to get here we need to calm our roads down and provide proper cycling infrastructure big time. Strict liability too, so much as touch a cyclist (or a pedestrian) with a car in The Netherlands and you've got to go a long way to prove you couldn't have avoided it. Was that picture taken last century, in the '70s? Where are the disc brakes and suspension? That all sound rather controversial. One moment you are claiming that all vehicles are being deliberately driven as fast as possible, which we all know is not true, and the next suggesting that all cyclists revert back to a different cultural's habits and imposing all of that upon everyone, and within a completely different cultural environment? Why as you know surely that this is a pointless position to propose ? Not sure even you 'believe' this concept has any merit whatsoever? Cycling isn't 'perceived danger' it is and can be dangerous if you don't travel safely. One reason why the authorities don't promote it too much! Amsterdam is a very different cultural environment from it's structure to the people. You cannot just impose one on another. It would cause havoc. Even your proposal here is met with disgust. Most cyclists in Holland I am told simply dump their bikes outside locations and don't really care about them. I gather many are stolen to the point where people just use another's bike ?! A kind of general bike pool? You really want that over here too ? However some input from another's Countried concept can be discussed and considered. I think there are many issues with the video. Some cyclists do have a time to time trials on the road, (discussed before), and it is highly questionable. If racing then it needs to be approved and organised for safety's sake if nothing else! Hence why when cars do so, it is usually followed by a police chase to end it. If we applied that to those cyclists who think that the roads are race tracks and they 'mustn't stop' then that alone might see far less cycle KSI/yr. If you want to get back to cyclist who (are out there already) who carefully travel as shown in parts if the video like in the photos, but plsu without Hi-vis and helmets, then there is already a section that travel like that. Are you trying to point out that they would 'feel' more danger and so slow down, and you hope that traffic would slow also perceiving in their more vulnerable state ? If people look put for their safety then they won't get into the incident in the first place. Isn't that a far far better position to aim for? I can cycle perfectly safely all over London. Be very happy to show you or anyone how I can manage this. And it is simply about managing risk and knowing how to be safe. These are skills that seem to be remarkably lacking in some people. So you want a whole sector of the public not to be responsible for their actions and you want everyone else to keep them safe, as they can't manage it for themselves? Is that want you'd like ? Really? That is a pointless and dangerous situation. To make a section of the public irresponsible for their actions! What happens when peds and horse riders decide that they are now at the 'most vulnerable' state and they have no responsibility for their actions? So every cyclist who hits a ped, not matter who steps out when will then see a litigation case where they are 100% held responsible because they happen to the cyclist who had the misfortune to be there at the wrong time, wrong place ? So why should someone who likes their racing style, and travels quickly when safe, now told that they now have to ride on a less preferred bike, (potentially less safe & less comfortable bike), and to ride in a manner that you consider acceptable ? Why ought they behave as you might prefer ? We don't need to 'calm the roads down' whatsoever. (With the exception of the reckless and dangerous drivers.) We need to re-train cyclists to behave in a manner that they always strive to be responsible, predictable, manage risk well and have good judgement. One of the cyclists in the vid says how he's only had one or two incidents, but the racer cyclist by chance example, takes a spill and was riding in the 'prime position' IMHO. I think attitude has become ruined in many cyclists, they seem to have perhaps forgotten that riding should allow for others on the road. That they should always be aware of all events around them, and try not to impede others progress, as they are not trying to impede theirs, and to abide by ALL road rules, have they forgotten this or think they are now on some 'higher' plain or something? For that lady at the end to have received any compensation is only because the lorry also ran a red light, she was fortunate. An appalling and sad un-necessary situation. To imply though that he shouldn't have run a red light because he left a family implies if you don't it doesn't matter. However I will assume that it was just her thinking within her very emotional situation, and that what she perhaps meant was to encourage all cyclists to never disobey the laws of the road, and especially red lights. If you can stop in time for the amber light as applies to all traffic, then you must. Never ever chance the red light. Strict liability is a recipe for disaster for all sides, and does not serve the public whatsoever. There is no place for it in a fair and just society. Holland has it incorrect IMHO, but it is for them to decide. It does not mean that therefor we need to introduce another bad policy for this country. Let's not forget that we have had the safest roads in the World decade upon decade. We need to remember that we know what it takes to have safer roads than anywhere else. Observe and consider what other Countries do but not necessarily implement it. There are four other countries in the European union that don't operate a policy of strict liability. It's coming, mark my words. Also, road calming and dedicated infrastructure. "Eight London red routes set for 20mph speed limit"
"Boris Johnson hails 'big day for cycling' as work starts on flagship superhighways across London"
I disagree, there are absolutely things that happen that are totally out of your control. Your safety also depends on the behaviour of others, not just your own. Your safety also depends on the behaviour of others, not just your own. Which is true for absolutely everything in life from birth to death. Well, you;d better tell safespeedv2 as they are asserting that you can 100% avoid any situations just using your own awareness and skills. What about somebody sitting in a queue of traffic that get's rear ended by some idiot on a phone for instance. Or a pedestrian that gets hit by a vehicle that mounts a pavement at speed. What are you precisely disagreeing to ? The road is governed by rules and regulations that provide predictive behaviour. When those who are reckless and dangerous behave outside those normal actions then yes they can put theirs and others lives in danger. However this doesn't mean that as a good cyclist or driver that you will become involved in that incident, because of applying all the COAST principals, managing risk well, having good judgement and then there is all of your amassed experiences of course! It is exceptionally rare that you can be involved in an incident that you could have otherwise avoided. But you are moving the goal posts - don't, just stay on topic. We are specifically speaking about cycling safely not rare accidents. Are you or are you not fully in control of your bicycle and not aware of all your surroundings?